I just posted a request for this variety if anyone has a few seeds that need a good home. has anyone had an RL plant pop up from starting KBX seed? While not specific to KBX, I regularly find regular leaf seedlings mixed among my potato leaf tomatoes. I also find other leaf form variants that are clearly the result of crosspollination. For example, I have Aunt Ginny's Purple in my growout this year that is producing about 3 regular leaf plants per 100 seedlngs. I also have a single plant of Silvery Fir Tree that is obviously crossed based on leaf form. Crosses happen folks. The important thing is to recognize them and decide if you want to save the resulting seed. I have some very interesting crosses in advanced stages of dehbridizing. They are here because I recognized a chance cross in my seed flats or in my garden. In growing out KBX for the past 5 seasons I have had the odd RL plant occur. When I first discovered what I named KBX (short for Kellogg's Breakfast Unknown if Crossed) back in 2002 it was because a package of Kellogg's Breakfast had a 50/50 grow out of RL and PL. My curiosity was piqued and I just had to see what would happen if I grew out the PL plants. I kept it to myself for a couple of seasons to see if the saved seeds grew out true to form and had the same amazing taste as they did in 2002. They did and I took a fruit or two to Tomatopalooza [tm]III in 2005. Craig tasted it and went back for seconds, Jerry spooned up seeds to take back to Ohio, several others asked for seeds and KBX was off and running. Martha, you forgot that you and I were both still posting on AOL, my we've known each other for a long time, LOL, and you first described it there and you were also distributing seeds there as well. I honestly can't remember if I got some seeds from you back then, or not. Yes, thank you Martha. I got mine two years ago and side-by-side with KB, KBX has performed very well. In size, production and taste (my family taste ratings) KBX was on average bigger, grew more tomatoes per plant and rated half a point higher on flavor than KB. We appreciate your work. Martha’s correct. I spooned up seeds to bring back to Ohio and have been growing it ever since. I’ve always gotten PL plants with terrific tasting fruit. Actually, I’ve stopped growing Kellogg’s Breakfast because KBX performs so much better for me. The RL plants from the 50/50 packet grew out orange beefsteaks as well. However they didn't produce as heavily and went down to disease, from what I can recall, almost 6 weeks earlier than the PL plants, which produced until frost. I was doing a google search on KB and came across with this 11 year old thread. Might bring back memories for some of you. I got some seeds of KB donated , few years ago. I planted seeds last year year but did not germinate. I did not givel up. So I planted again this year. I was getting disappointed. Most my other,seeds,germinated in 4 to 6 days. But it took Kb TEN days. Finally got couple out of a,bunch of them. I suspect that,the seeds that I got were of poor quality. OR MAYBE this is a characteristics of KB?! Now I know that KBX is a better choice. But it does not matter too much to me a s I am not interestemd in a big crop. What i like,about it is taste, size, color and shape. I am growing Kellogg's Breakfast for the first time too. i can't understand how anything would be different in regards to taste, production and disease resistance. Shouldn't they both be identical in growing habit if there was no crossing? i grew KB for a few years. I then started growing KB and KBX. For me, in my hot summer climate; the KBX was slightly superior in all categories but highly superior in taste, fruit size; and production. I invite people to visit my garden. I focus on red tomatoes, but make sure I have a few KBX in the garden for people to notice as they wander around. I wait for the question "what is this?". Most people are not aware a fully ripe tomato can be orange in color. I make sure they have some large ones to take home as gifts with instructions to tell me what they think after tasting them. I wait for the phone call or email. Everyone seems astounded that an orange tomato can have that "old time" tomato flavor. The KBX was the first variety to germinate under lights this year. It seems all the planted seeds germinated and the seedlings have been growing so fast that I am concerned they may be exhibiting hybrid vigor in growth. They are already double the height of the other varieties under identical growing conditions. Last edited by DonDuck; February 26, 2019 at 02:38 PM. 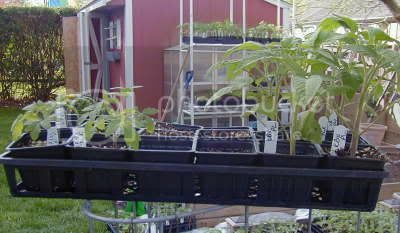 I searched a few tomato sites and seed sellers. Some say all is the same, some say one is better than the other and some say it is a cross. The consensuses seemed to be that the taste was the same but KBX was more productive. I did a test trial side by side last year. My KB produced fewer, smaller fruit and went down hard and fast to disease. KBX kept going into November.